Discarded shutters open up to a new life in the Paul Smith windows in SoHo. We all love our collections, no matter what they're made of. So show them off! Don't stuff them in the bottom of a cabinet or hide them in the back of a closet. 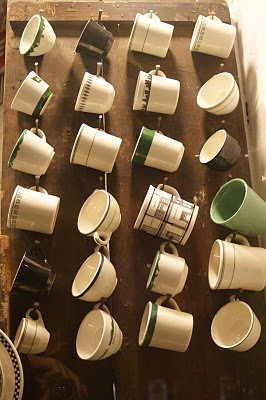 Even mismatched coffee cups can take a place of honor like these in the window of Fishs Eddy. By creating a regimented hanging pattern for these everyday pieces, all of differences complement each other in a unique piece of wall décor. Yesterday, I spent an hour on Twitter chatting about vintage and thrift finds with a ton of Twitter pals in a weekly Tweet-Up called DesignTV, hosted by the fabulous interior designer from Nova Scotia, Jonathan Legate, and his sidekick/blogger Amy Cupp. 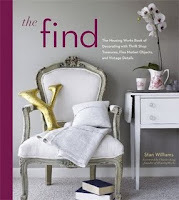 Go post your favorite find on DesignTV's Facebook page and you could win a personalized copy of my book The Find. If you're the lucky winner, I'll even wrap it up in a vintage ribbon and ship it right to your door. I do love Paris in the springtime. But for me, any time I'm able to visit always ends up being my favorite time of year. I've been in Paris in January when my days were shrouded by gray skies and drizzle. And I've found myself there during the summertime when barely a soul was on the street. Strikes that shut down everything -- including the national museums? I've experienced that as well. And magical spring evenings where the light is long and the streets start to perk with activity? Ah yes, luck has brought me there, too. I visited Paris for the very first time in the 1980s as I was on my way to study at the University of Bordeaux. And from the moment I stepped off the glamorous Air France flight that landed in Charles de Gaulle so many years ago, Paris has always held a special place in my heart. So imagine how amazed I was to find this "Miniplan de Paris" from 1959 in a box of ephemera I bought for next to nothing at a New Jersey flea market. 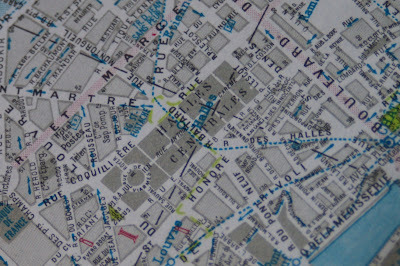 Written in pencil on the map's red cover is its price: 316 Old French Francs, which converted to about 65 cents back then. Also on this relic, the city market, Les Halles, still exists in a spot that is now the location of a gigantic subterranean shopping mall and transportation hub. The Centre Pompidou had yet to be built, and the Gare d'Orsay was still a train station, but for the most part, this map could take you through Paris just as easily as it must have more than 50 years ago. 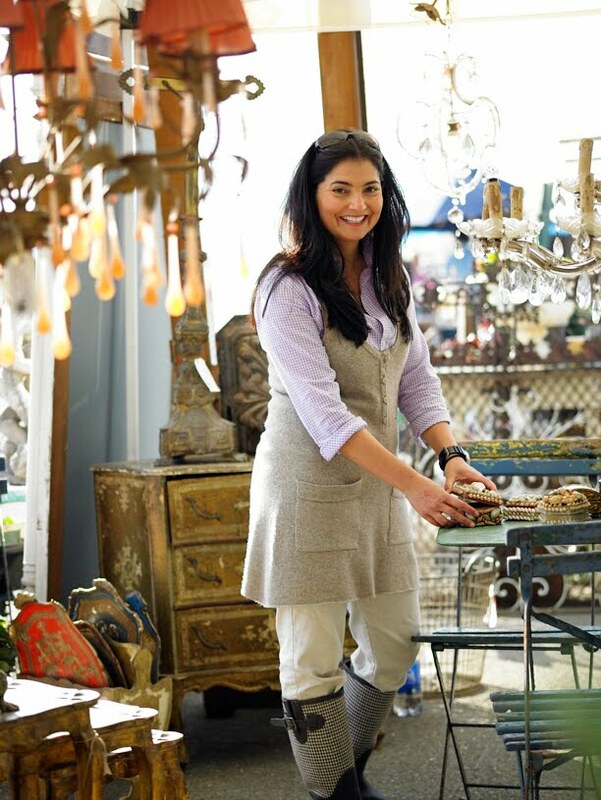 Join me today at 11:30 a.m. EST on Twitter as I chat with @DesignTVChat (#DesignTV) about my love for vintage and thrift. We're going to give away a copy of The Find! You know I love a great find, especially if it costs absolutely nothing. So as I was perusing one of my favorite blogs, Thrift Core, created by the incredibly talented writer and graphics designer Vanessa Alvarado, I noticed that she shares with me a passion for saving items originally destined for the garbage. So I asked her if she'd share with me one of her favorite discoveries, and here it is -- a colorful game board that continues to inspire even after someone else tossed it to the curb. "My favorite dumpster diving haunt is behind a picky thrift store," Vanessa told me. "They throw away lots of interesting vintage treasures, including this beautiful Risk game from 1968." "You don't go anywhere in life, especially as a creative type, without taking risks," she says. 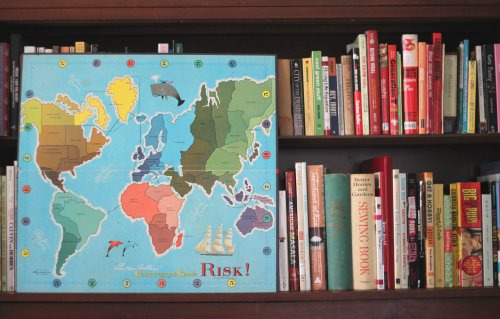 "I love to display this game board in my home not only for its beauty, but for the important message: take risks, meet more people, and treat life like an adventure!" For a little chat about vintage and thrift finds, join me on Monday, March 28, 11:30 a.m. Eastern Time on Twitter as I'm a guest of the fabulous Canadian interior designer Jonathan Legate (jonathanlegate) and his sidekick Amy Cupp (ABCDDesigns) on their fun and frolicking #DesignTV. Even those these scenarios were quite luxurious. 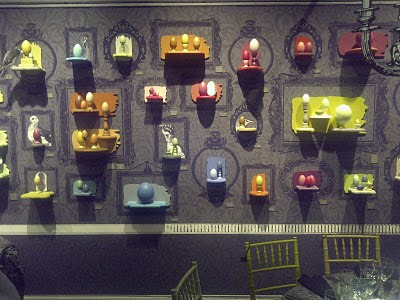 The table displays at DIFFA's Dining By Design offered lots of options for repurposing humble items into fantastic accents. 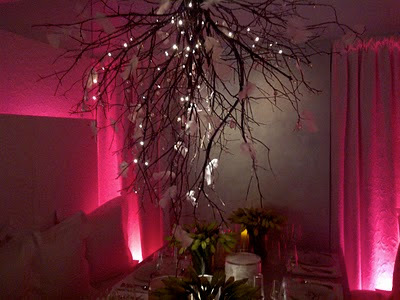 My hosts, Scandia Home, set up plush surroundings delicately illuminated by a feathered and twinkly twig chandelier. 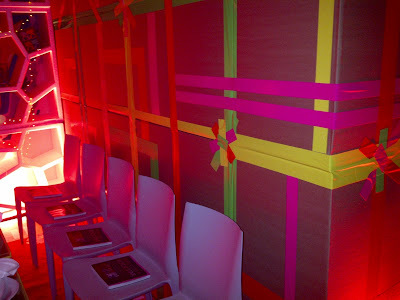 Colored tape on cardboard walls ratcheted up the style meter at the Jesgordon/Properfun setting. For the Ralph Lauren Home table, the designer took what could have been vintage finds and painted them white to visually unify them. 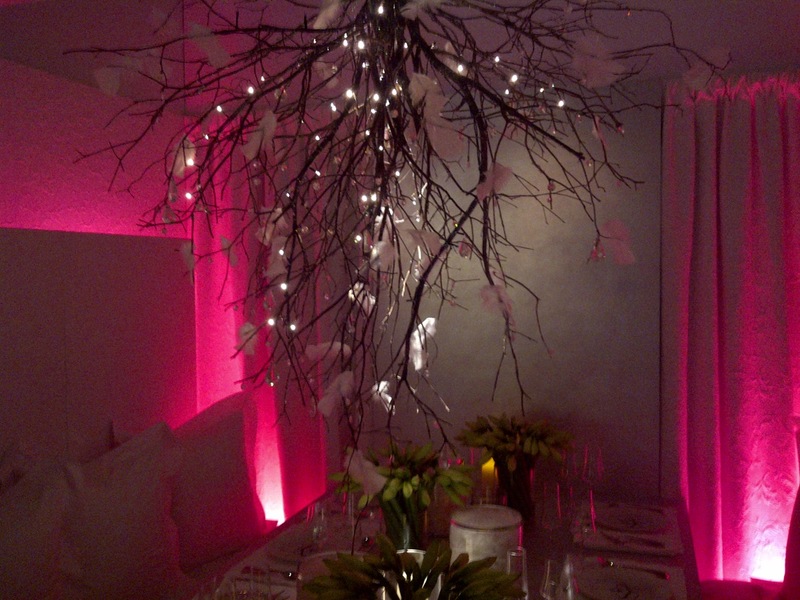 One of the least expensive ways to change the tone of the room is with paint, and this image I took of David Stark's setting for Benjamin Moore paint at DIFFA's Dining By Design gala drives that point home. With nearly all of the visual effects created by paint hues, the cheery, colored egg theme is perfectly framed for a festive springtime table. 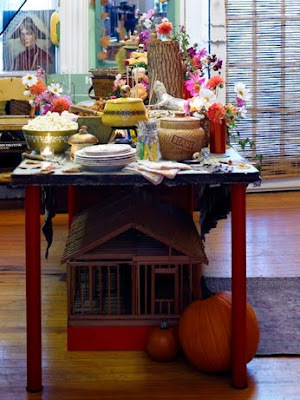 People ask me all to tell them about the beautiful image photographed by Jim Franco on the cover of The Find: The Housing Works Book of Decorating with Thrift Shop Treasures, Flea Market Objects, and Vintage Details. And I can understand why, since it is the magical work of Maison Rêve's Yasmine McGrane. Yasmine is known as one of the best flea market shoppers in the country. And among her favorite pastimes is hitting the Alameda Point Antiques and Collectibles Faire in Alameda, California, looking for antiques, whimsical accessories and taking in the thrill of the gorgeous outdoor market. The owner of Maison Rêve, a suburban country outpost that encourages creativity, is always on the hunt for antiques (not reproductions! 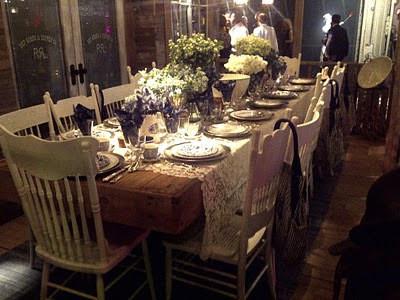 ), old doors, French metal garden chairs, and any other whimsical items, be-it a wagon load of Christmas balls or a dainty feathered tree. In fact, she’s been known to re-arrange important affairs just to make it to her favorite destination, and even considered missing a friend’s wedding when the dates collided. Let’s just say that she decided to skip the flea market – but just that one time! McGrane is an expert at getting the best deals at flea markets. She suggest arriving early for the best selection, or later for the best deals. Always carry cash, and make sure that whatever your buy will fit into your car or your home, for that matter. She takes a trolley with her so that she can easily zip through vendors’ stalls, and always wears her favorite Wellie boots to keep her feet all toasty and dry on those early morning treasure hunts. The Object of My Desire: Have a Cow! The sunny days like the ones we had this weekend that make me thing of my favorite garage sale adventures like the one a few years ago in Santa Monica that turned up this cheery pitcher. I almost left this piece behind because the man running the sale said he wanted $10 for it. I mean, he was asking for 10 whole bucks from a guy who hits garage sales with a Zip-Lock bag filled with change. And $10 is a garage sale budget that usually lasts a whole day! So I held the pitcher in my hand as I wandered the yard inspecting other items strewn about. I loved the bright red accents, the undamaged relief and the shimmery golden bell. Heck, I couldn't buy a new pitcher for $10, so I gave in. While I definitely didn't buy the vessel because I thought it was a collectible, I later discovered that it actually was. 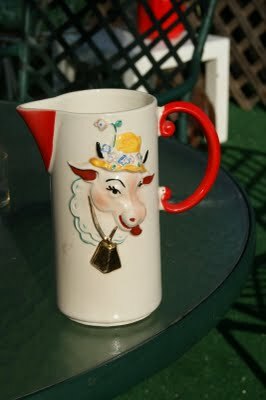 What the seller told me was Borden's Elsie the Cow actually came from the Old MacDonald Collection made by Regal China in the 1950s. It's true. My compactor room is quite often a treasure trove. So even if this brand new, down-stuffed pillow is not your taste, it was lovingly left there yesterday. And I found it as I was taking out the recycling. I'm not sure if I'll keep it or give it away, but it was too pretty to go out with the garbage. Hope your weekend is full of surprises! Reuse & Repurpose: Bon Appétit! When the Corner Shop Café on my corner finally re-opened a few weeks ago, the first thing I noticed even from my street-side view were these new pieces of fantastic wall décor. The assemblage on top is made up of tools used to make the food, while the series of silverware mounted in red trays features tools used to eat the food. This humorous sweater display in front of a vintage shop in Greenwich Village reminded me of the wacky thrift store discovery that Barneys New York's Simon Doonan showed off in The Find: The Housing Works Book of Decorating with Thrift Shop Treasures, Flea Market Objects, and Vintage Details. When he spied an antique wicker baby carriage for $195 at Housing Works in Chelsea, he immediately dubbed it the Rosemary's Baby Carriage and suggested giving it a thorough cleaning, a coat of nontoxic paint and transforming it into a laundry hamper for a children's bedroom in a Manhattan apartment. "When it's full of laundry, just wheel it down the hall to the washing machine," he suggested. "And when you're done, just leave it in the hallway by your door to freak out the neighbors! Creepy!" 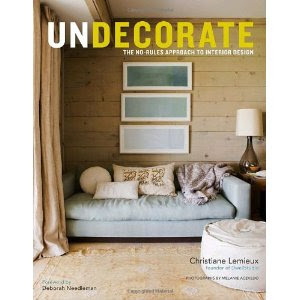 Just the title of Christiane Lemieux's new book Undecorate: The No-Rules Approach to Interior Design (Clarkson Potter) makes me want to run right out to the book store and buy it. And I will, especially after reading an excerpt in the digital magazine Lonny that featured the home of Andy Newcom, a stylist at Hallmark Cards in my hometown of Kansas City. I can't seem to get enough of this inspiring space filled with vintage treasures that breezily mixes with modern lines and antique romance. Truly a breath of fresh air. I'm not a big fan of the overly fussy and slickly polished. That's probably why I've found myself in many heated discussions with people who are dead-set in their preference of stainless steel kitchen appliances -- everywhere, and in every kitchen. What can I say, but boooooring! Instead, I'm pulled into a room that even though carefully planned, naturally exudes a lived-in sensation, full of personality and void of cookie-cutter notions and showy objects. I enjoy seeing a row of pillows living on a sofa that haven't been subjected to a decorator's karate chop. And it bother's me not one bit to see see an air conditioner poking through a living room window. If you live in New York like I do, that's often just part of the expected view. In my anticipation of picking up Undecorate, I was reminded of a photo I took of a charming, yet undecorated room when scouting the Fire Island vacation community of Saltaire for my book The Find: The Housing Works Book of Decorating With Thrift Shop Treasures, Flea Market Objects, and Vintage Details, also published by Clarkson Potter. It's true that the electrical cords are all askew and the shades on the lighthouse lamps are on a funny tilt, but the green wooden glider and the sun streaming through French doors can't help but captivate, making this a space I would be happy to find myself on any given day. If you have a copy of The Find and would like a personalized bookplate, email me at theelegantthrifter@gmail.com and I'll pop one in the mail for you. A while back I shared this towering image from the apartment of Ted Giza, head stylist at the John Barrett Salon in Bergdorf Goodman. Made entirelyof Hermès china boxes, he carefully, and cleverly, wedged these orange symbols of luxury to form a whimsical column that stretches floor to ceiling in his 1,200-square-foot loft in Asbury Park, NJ. And what does Ted call this structure? "Excess 2008: Medium Hermès Boxes." Spotted in the East Village, these little guys standing on the front steps as the raindrops fall. 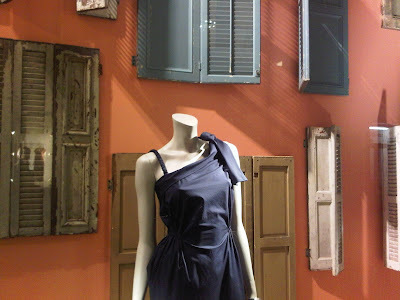 Veli snapped these images on his last visit to Zagreb, the capital city of Croatia, knowing that I'd get a kick out of the way a clever window witch there transformed unlikely objects into wild and wonderful vests. The one in front is dangled together by strands of beads, while the one off to the right composed of women's gloves. What is the one on the left made of, you ask, batting your eyes? (Hint, hint) Strips of false eyelashes! As we take in the scene from farther back, you can see on the far left a creation designed out of men's gloves, and in front of it, another crafted from a deck of cards. The remaining one on the right, however, still has me tickled and amazed at the same time. It's a wigged-out vest, with the faux hairdos' natural contours forming quite the shoulder pads! When I was a kid, we used to mail greeting cards for nearly every occasion. 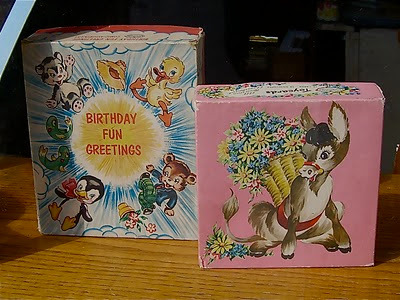 Of course, we sent out birthday, Christmas and Valentine's wishes, but we also offered cards for Thanksgiving, St. Patrick's Day, Easter and Halloween, as well as to our parents and grandparents for Mother's and Father's Day. And don't get me started about a written thank you note. Any gift we received required a personalized acknowledgement, detailing how much we appreciated the specific gift and how we planned to use it. I don't know about you, but my receiving cards on any occasion has slowed substantially. With the exception of a family friend who still remembers every single holiday, my own list of Christmas cards received has dwindled, and most birthday messages these days come via email --- or even worse -- Facebook. That's why I was stopped recently by the cheerful display in the windows of The Greenwich Letterpress in Greenwich Village. Shown here, the vintage sentiments burst with colorful, thoughtfully designed animals that remind me of the of notes we used to receive from my grandparents, friends and relatives as a child. Such was the anticipation of what the postal carrier would bring to our house that my sister and I would often argue over which one of us would get reach into the mailbox and reveal its contents. While I still look forward to my daily postal delivery, it's mostly made up of ads, bills and credit card offers. But occasionally there's an envelope containing a friendly surprise, and when there is, it still makes my day. While I find everything about this tabletop charming and cheerful, from the Pyrex bowls holding popcorn to the wildflowers in colored metal glasses, I especially love seeing the bean pot that my mom and dad got on their wedding day in 1962 nestled in the front corner. Photographed by Jim Franco for The Find: The Housing Works Book of Decorating With Thrift Shop Treasures, Flea Market Objects, and Vintage Details, this image is the creation of my Brooklyn pals Michael Quinn and Heather Kerr, two party throwers extraordinaire. A few years ago when we were packing up Ruth Handel and Johanna Went's garages sale that Bob Greenspan photographed for The Find, Ruth urged me to pick an item from the leftovers to take home. 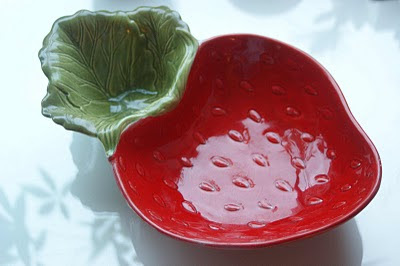 Of course, like a crow, I was attracted to the most colorful, kitschiest object that nabbed my eye -- a strawberry-shaped chip and dip bowl made in California by Poppy Trail. This cheery piece of pottery always brightens my day and reminds me that my favorite time of year -- garage sale season -- is on its way! I believe that maintaing good thrift karma, along with having a little patience, always pays off. So I'm rarely surprised when I'm out thrifting and always seem to find items that are perfect for my best friends. 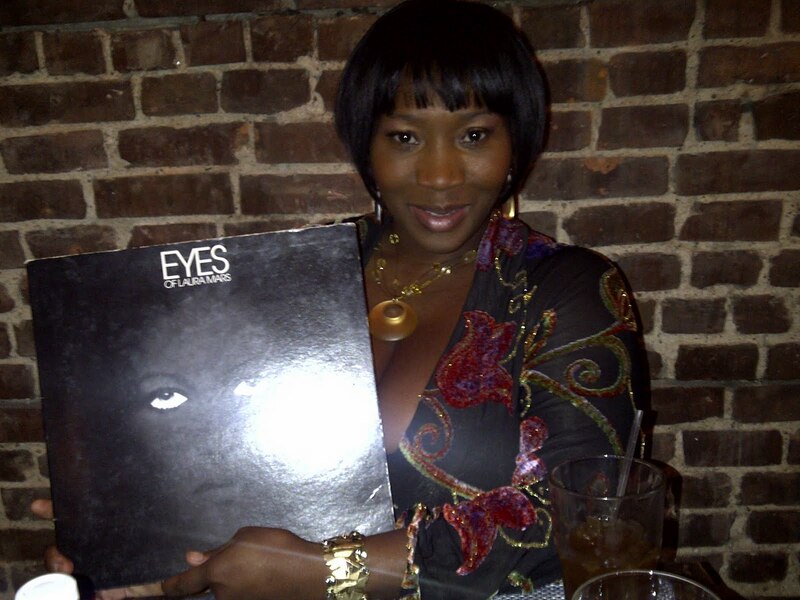 Take this this "Eyes of Laura Mars" soundtrack album I found for $1 at the Brass Armadillo Antique Mall just outside of Kansas City. Not days before I discovered it, my pal Bevy Smith shared with me her fascination with this fashion fantasy, murder mystery from 1979. And sure enough as I'm strolling the aisles of this thrift emporium (Photographer Bob Greenspan and I hit every aisle. It took about five hours in total), I see these iconic eyes staring up at me, marked $1, just just begging for me to pick them up and bring back to Bevy. Reuse & Repurpose: A Great Mix-Up! You don't have to show off your prettiest plates on a tabletop in a china cabinet, especially if they are thrifty treasures that you enjoy peering at every day. Mix and match them up and create a sculptural piece of wall decor on rustic, vintage doors like the folks at Fishs Eddy did recently, all under the inviting theme of "Get mixed up with us!" This truckload of pianos sat in front of my apartment building all weekend long. I imagine this arrival was for a lounge that's opening up on my corner. Now if they're going to actually tickle these ivories, I do hope a piano tuner is on his way. Or maybe this is the piano tuner making his delivery. I love meeting all the people who in some way have been touched by The Find: The Housing Works Book of Decorating With Thrift Shop Treasures, Flea Market Objects, and Vintage Details. And even though The Find was released almost two years ago, I'm continually humbled and amazed when I get an email out of the blue telling me how its words and images have inspired them. Truly, those are the most encouraging words an author can hear. If you have a copy of The Find, shoot me an email and I'll mail you a personalized bookplate.